Last week on RAW, Foley had an issue with Owens and Jericho. Reigns also had an issue with them. Later on, Jericho tried to take Reigns’ US Title but Owens attacked Reigns during the match. Then Rollins showed up. He had an issue with Jericho and Owens as well. Stephanie McMahon heads to the ring. Foley can’t be there, so Steph does Mick’s usual cheap pop by name-checking the host city. Steph goes on to say that RAW is going to dominate at Survivor Series. She begins introducing the five men competing on team RAW, starting with Kevin Owens and following with Chris Jericho. Roman Reigns is next, then Braun Strowman, then Seth Rollins. With all five men in the ring, Owens complains about Rollins being on the team. Rollins says RAW has a guaranteed victory if he’s on the team, but nothing is finished between him and Owens. Stephanie calms things down by showing an image of team SmackDown. She gives her team a pep talk punctuated by saying their jobs depend on their performance. She drops her mic and leaves the ring. Owens agrees with Steph and says that they all need to be on the same page. Jericho says Rollins and Reigns might be stupid idiots, but they’re their stupid idiots. Team Kevin and Chris are the co-captains so everyone should follow them and do what they say. Rollins and Reigns get tired of listening and attack Kevin and Chris. Strowman decides to attack anyone he can grab. Stephanie comes back out and says she’s going to let everyone get their frustrations out of their system. She sets up a fatal five way match for tonight. This was an okay match. It started off strong with Noam Dar’s RAW debut, but after a commercial break all the energy seemed to go away. The ending worked, but it was kind of quiet and uneventful. After the match, Brian Kendrick gets on the mic and tells Noam Dar that Dar lost the match, not Kendrick. Kendrick tells Dar that he has no talent, but Kendrick is the best cruiserweight in the world. As Kendrick is talking, he punches Dar and stomps him. Dar fights back and hits Kendrick with a running enzuigiri. Kendrick rolls out of the ring and backs away. Clips of Goldberg’s journey to his match with Lesnar at Survivor Series. Sami Zayn approaches Stephanie McMahon in her office. Steph tells Zayn that his presence is irritating and she doesn’t think he deserves to answer Dolph Ziggler’s open challenge. She thinks Rusev should have the shot, but Foley wants Zayn. To resolve the issue she makes a make between Rusev and Zayn with the winner facing Ziggler for the IC Title at Survivor Series. Enzo Amore and Big Cass head to the ring. They’re followed by Anderson & Gallows, then Golden Truth. Cesaro & Sheamus come out next. Sheamus wants to get something off his chest. He thinks that with New Day as team captains, Team RAW has no chance of winning at Survivor Series. Sheamus decides to name himself captain, but Enzo and Cass don’t think that’s a very good idea. Sheamus then gets in Luke Gallows face for laughing, so Gallows calls Cesrao “Euro-trash.” Cesaro thinks that’s very funny and original, telling Gallows he might as well have called him Swiss Miss or bald. Cesaro starts a “shame” chant, but Goldust wants everyone to take a deep breath. Sheamus gets fed up and starts to leave the ring. New Day comes out and heads to the ring, and they’re all dressed like William Wallace from Braveheart. New Day tells everyone that they will lead Team RAW to victory, but Anderson says he and Gallows are out as well. Big E then recites William Wallace’s famous speech, much to the appreciation of the crowd. Enzo likes it too. So does Goldust. Cesaro says he and Sheamus are in as well. Anderson and Gallows are in, but no one rules them. Pretty good match. It was solid throughout, but the finish seemed a little odd. It worked, but it seemed like they changed plans right at the end because of some hesitations. Goldust is happy about being on Team RAW, but R-Truth says he traded their spot for a time share from the Shining Stars. Clips of how Lesnar versus Goldberg came to be. 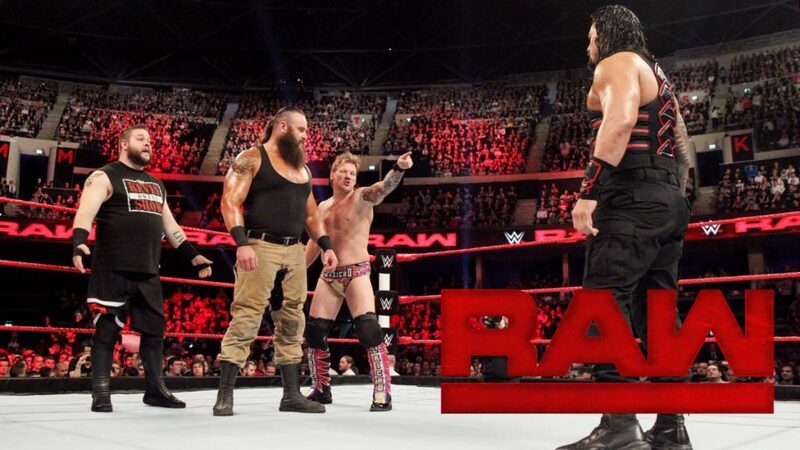 Jericho wants to give Strowman a piece of his mind, but Owens wants to be more diplomatic. Jericho storms into Strowman’s locker room. Owens repeatedly cuts Jericho off and offers to team up with Strowman. Jericho reluctantly agrees that it’s a good idea. Strowman thinks about it but decides that he’s on Team Braun. The Makeover of Emma to Emmalina is premiering soon. Pretty good match. R-Truth stayed in for a lot of the match before Goldust got the hot tag towards the end. The finish worked, though you could see it coming. In the ring, Michael Cole talks about Survivor Series and introduces Charlotte as the Women’s team captain. Charlotte says she was born a leader. Cole then introduces Nia Jax as the second team member. Nia says she doesn’t work for Charlotte. Cole introduces Alicia Fox next. Fox says she and Jax can be civil as long as it takes to win as Survivor Series. Bayley comes out next and says she will prove Charlotte wrong for thinking she’s the weak link. Charlotte decides she would like to introduce the final member of Team RAW: Dana Brooke. Cole says that Dana isn’t the fifth member of Team RAW, it’s Sasha Banks. Charlotte says she named Dana as a team alternate after the injuries Sasha sustained at Hell in a Cell. Sasha says Team RAW needs The Boss. Charlotte is dubious. This was okay. Alicia Fox looked a little awkward throughout the match, and Nia Jax didn’t do a lot. It only really got good when Charlotte and Bayley were in the ring together. Charly Caruso asks Seth Rollins why he joined Team RAW. He says he was promised future opportunities, but Braun Strowman walks up and says Rollins might not have any future opportunities after he finishes with him tonight. Good match. Zayn got beat up a lot but survived long enough to make the match interesting. I liked the finish. Good match. Strowman was the focus for large portions of the match, but Jericho and Owens also looked great as a team. There were some violent moments including the use of a kendo stick and a table, and overall this was a good main event. I liked the ending as well. I liked this show. Not all the matches were great, but many were good. I liked the bit with Golden Truth losing their spot, and the big stories were handled well. I think this was clearly the best match. There was a lot going on, the action was good, and the ending was unique.